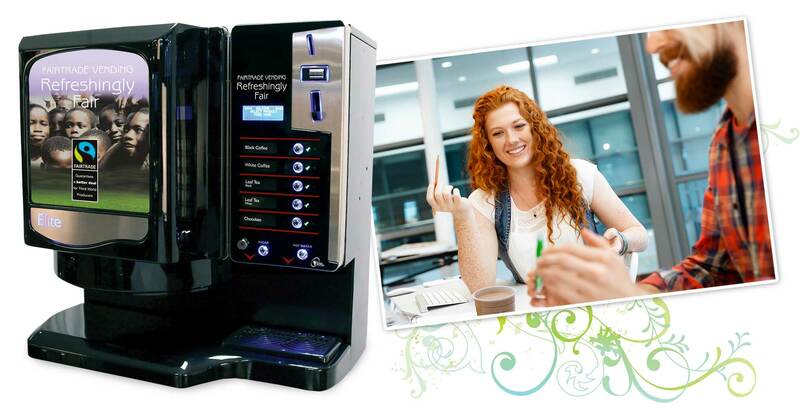 The Fairtrade Elite vending machine is an in-cup machine offering a choice of 5 delicious hot beverages. Finished in glossy piano black and stainless steel this feature packed semi-automatic drinks machine looks good in any working environment. The in-cup system ensures maintenance is kept to a minimum as the ingredients are pre-packed in the cup for greater hygiene and precise portion control. Integrated sugar dispenser ensures sugar is available for each beverage. A typical drink set up would be: white coffee, black coffee, fresh leaf tea, hot chocolate and soup. However the selections can be customised to any 5 drink choices. The perfect choice for the smaller office, waiting room or workshop. Ideal for self-managed locations.